Brick Lane offers a feast for the eye, and a great way to spend a lazy Sunday afternoon. Now I’m not sure if it’s politically correct to use the term graffiti when the talent beaming from these exhibitions is so obviously treasured and admired throughout the Brick lane area. People come from all over with their Nikons and Canons to flex those lenses on the colour and beauty of endless street art randomly splattered on nearby buildings. Amazing artistry on almost every corner, those eyes feel a little too real! Well well well!! Fancy seeing you here! You just have to stop and look…. You will not be alone with your big lens around here, that’s for sure. If this is your bag you will not be disappointed. There are so too many restaurants to count, and shops like the one below ‘Arzu’ to try something new. Love this shop – there was a huge queue as I walked past and whilst peering through the window the people in the queue were encouraging us to come in saying the food was really good. I never knew there were so many different types of pakora! Brick Lane is a foodies paradise – and this is not an understatement. Along with outdoor food sellers there is a large indoor hall filled with hot food sellers from all around the world. I wanted to try one of these but I was too full – a bit of sweet n sour in a cone would have been yum, they do look pretty don’t they! I had to try some of these! Including octopus aka ‘takoyaki’ – but there was a tiny bit of octopus surrounded by a lot of batter. I’ve had octopus before and its like a tough rubbery prawn. Sellers are keen to let you taste before you buy which is a nice touch. You will also find some interesting deserts and cakes as well as savoury foods. For those who like their designer bargains! I spotted this in a little vintage arcade, is this meant to be some sort of weird Barbie prison or what!! There is something a little disturbing about this – some might say artistic! 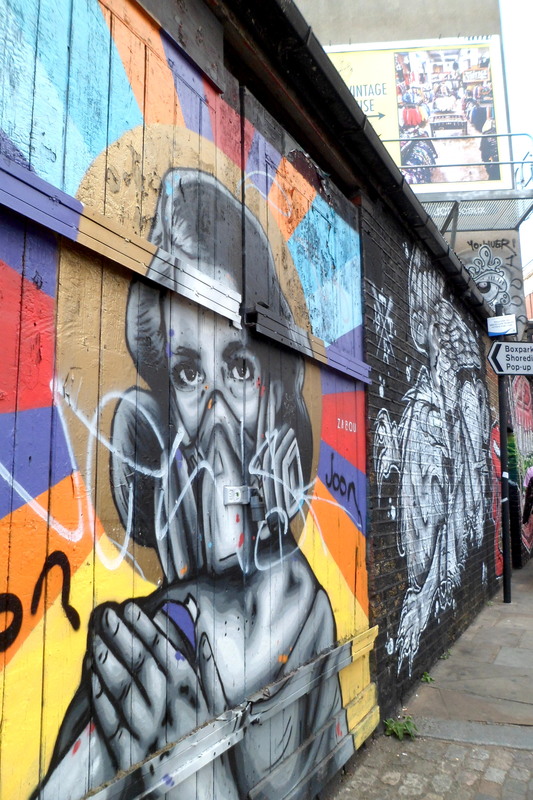 Brick Lane is now on the “must see” list for the next time we’re in England. Lovely street art. Thank you. I found myself in Brick Lane last October at the end of a month in England with the last week in London. The street art was unbelievable.